Improve your nutrition by making your own salad dressings! 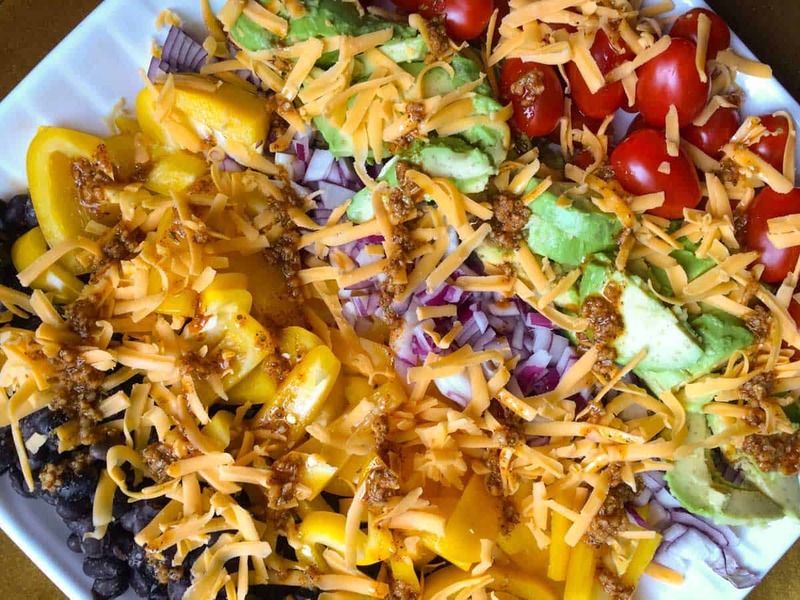 It’s SUPER easy to whip together these healthy salad dressing recipes! Your salad is only as good as your dressing. Mediocre dressing equals mediocre salad. Delicious/amazing/fantastic dressing equals delicious/amazing/fantastic salad! I didn’t start to LOVE salads until I started to make my own salad dressings. Homemade dressings are so fresh and full of flavour! Bottled dressings are drab in comparison. The good news? 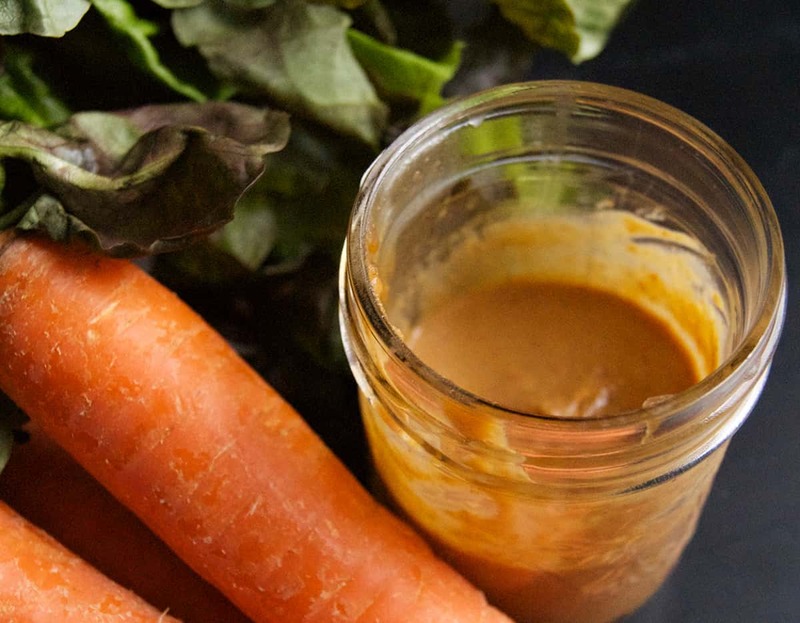 It literally only takes 5 minutes or less to make your own salad dressing! Even the laziest of cooks can find 5 minutes to spare, right? how I make it even EASIER and FASTER for you! Making a salad dressing only takes a few minutes but sometimes you end up spending twice that time searching for your recipes! 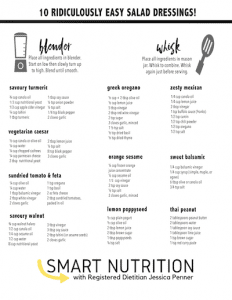 Instead of trying to re-locate these recipes online, I’ve created a printable that you can print and place in your cupboard! Then all you have to do is open your cupboard, grab a few ingredients, and BOOM! You’ve got a healthy homemade dressing in no time flat! 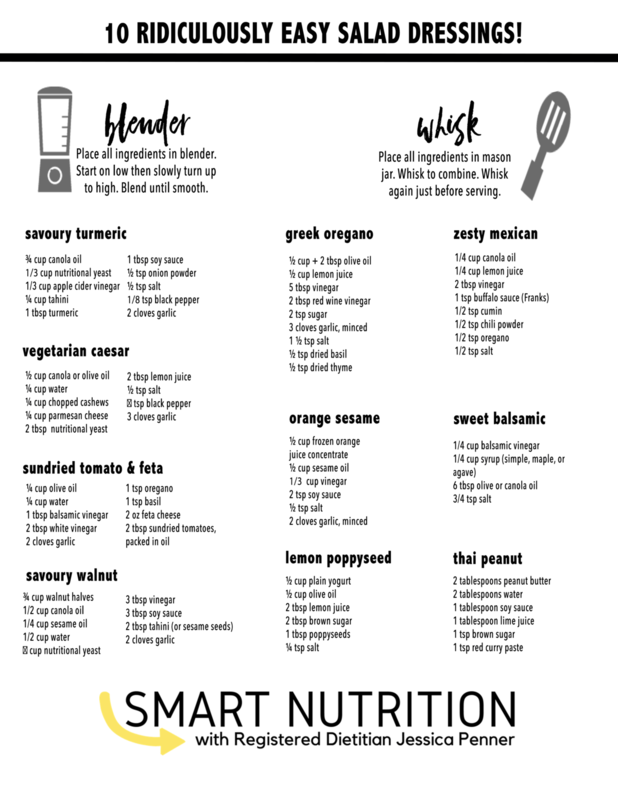 Scroll to the bottom of the post to download your printable now! 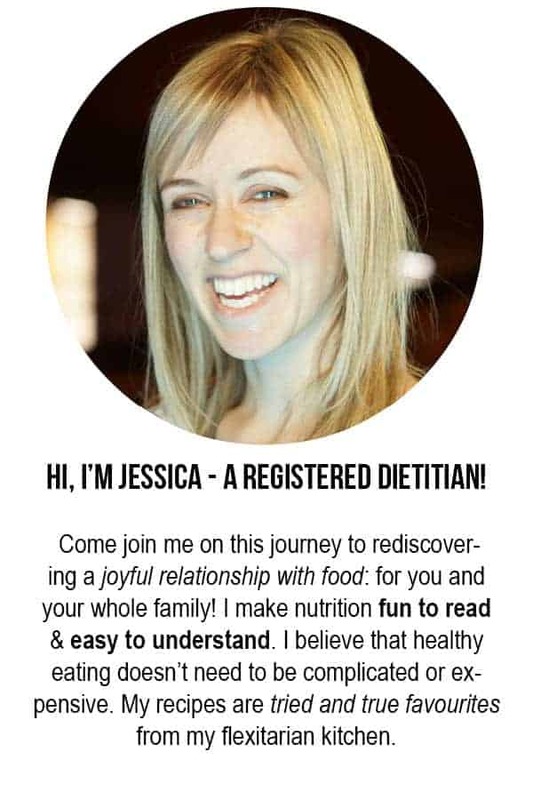 When you make food from scratch, it puts YOU in the driver’s seat with your nutrition. You are in full control of which ingredients go into your recipes. You control the amount of salt, sugar, type of fat, etc. 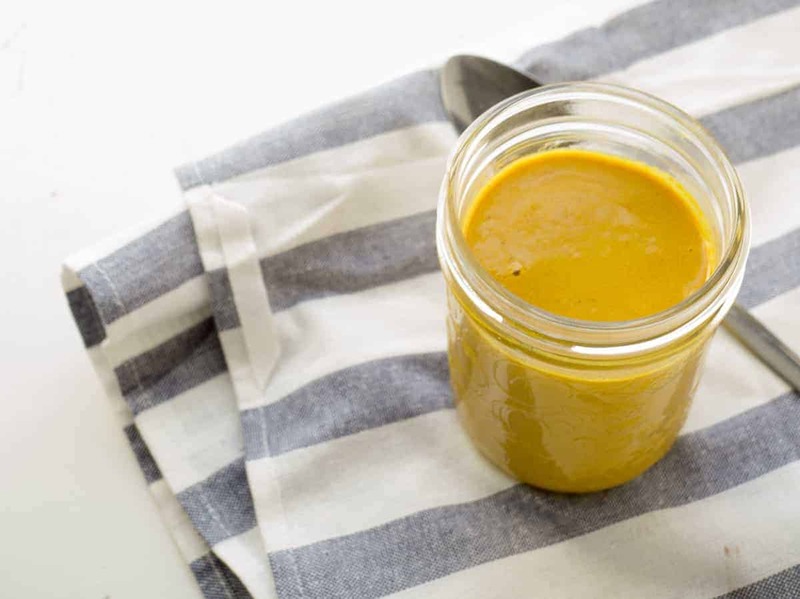 This vegan salad dressing is a gorgeous yellow and adds a beautiful pop of vibrant colour to your salad. The flavour is out of this world delicious! And guess what? There’s no added sugar whatsoever! My favourite thing is to throw it on a bunch of different veggies and top with peanuts. 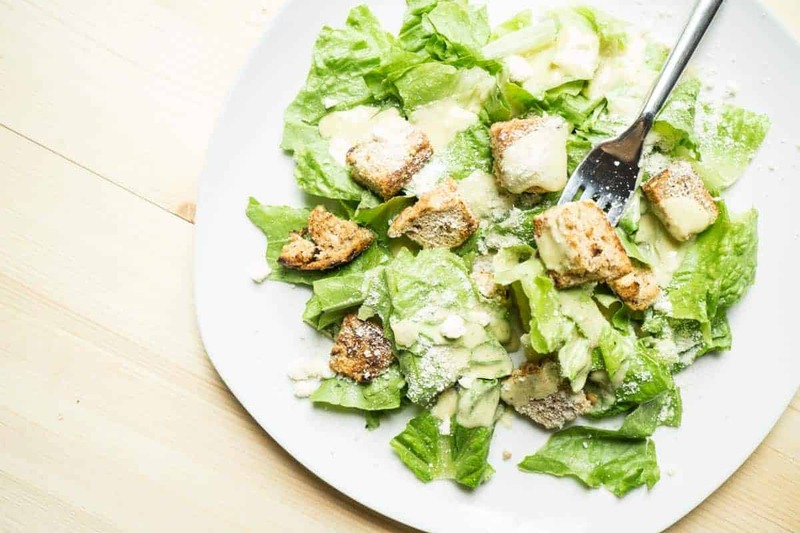 This caesar salad dressing is vegetarian friendly (no anchovies here!) and made in the blender, so it is SUPER easy to whip up. Pair with homemade croutons and fresh parmesan cheese and you’ve got a salad any restaurant chef would be proud of. A lot of bottle dressings rely on added sugar for flavour. This one has no added sugar. It doesn’t need it because it’s full of fresh, healthy, yummy ingredients! There are a lot of greek salad dressing recipes out there but this one takes the cake!…. er, I mean… takes the salad!? 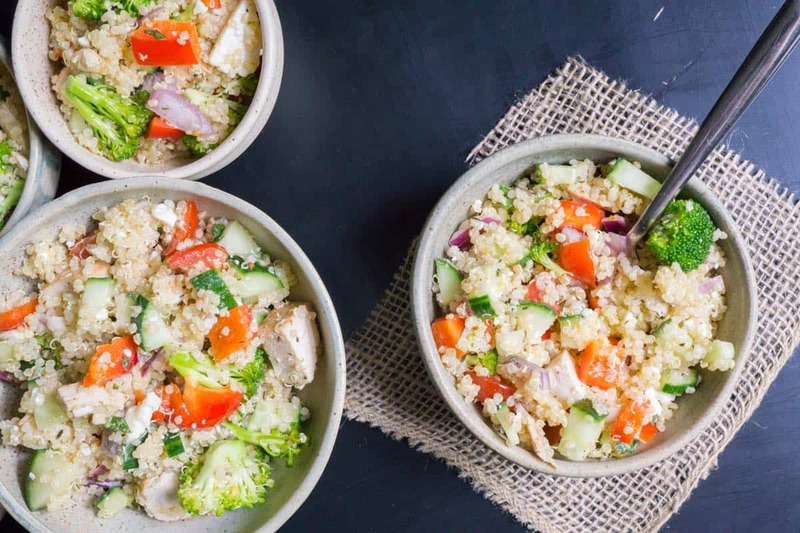 The link features this dressing as part of a quinoa salad but it is just as delicious on a tossed salad as well. If I could only use one word to describe this dressing I would choose UMAMI. “And what is that?” you’re asking? Fair enough, it’s not English! It’s the Japanese word for delicious, and it’s used in food science to describe the earthy, savoury flavour in food. The umami flavour is easily found in meat, but vegetarian dishes need to utilize strategic ingredients to acquire the flavour. And this dressing’s got it! 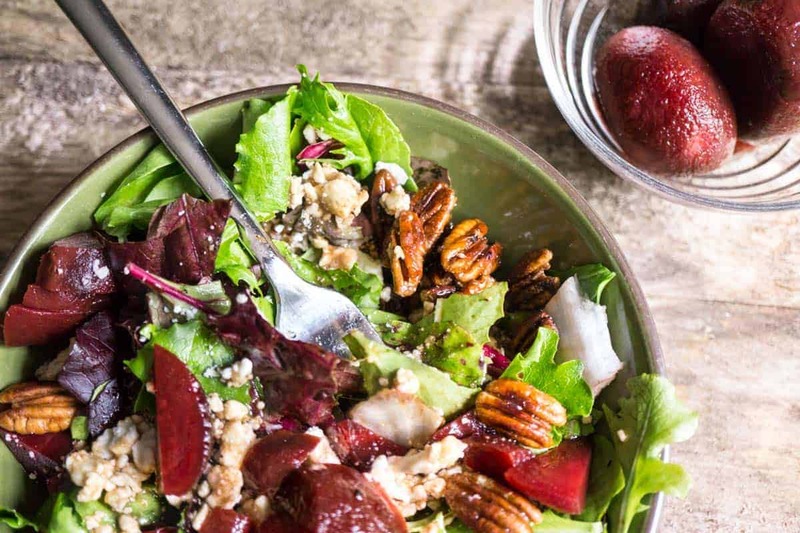 The walnut is a subtle flavour; all the ingredients work together to create a uniquely delicious dressing! Add a little fiesta to your lunch with this Mexican flavour inspired vinaigrette! With a touch of chili powder and buffalo sauce, it has just the amount of spice without overwhelming your tastebuds. This healthy salad dressing recipe tastes great with chicken, black beans, avocado, and a whole host of veggies such as sweet peppers and cherry tomatoes. 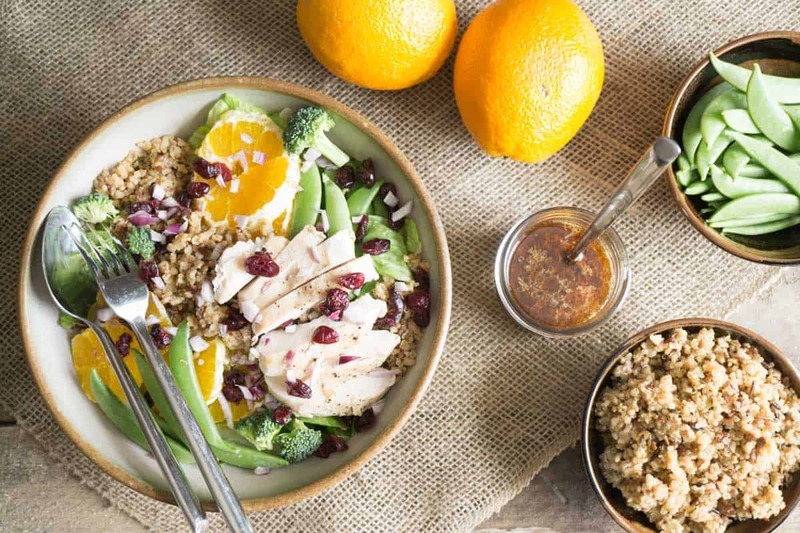 This citrus dressing has a surprising twist paired with sesame oil and soy sauce. 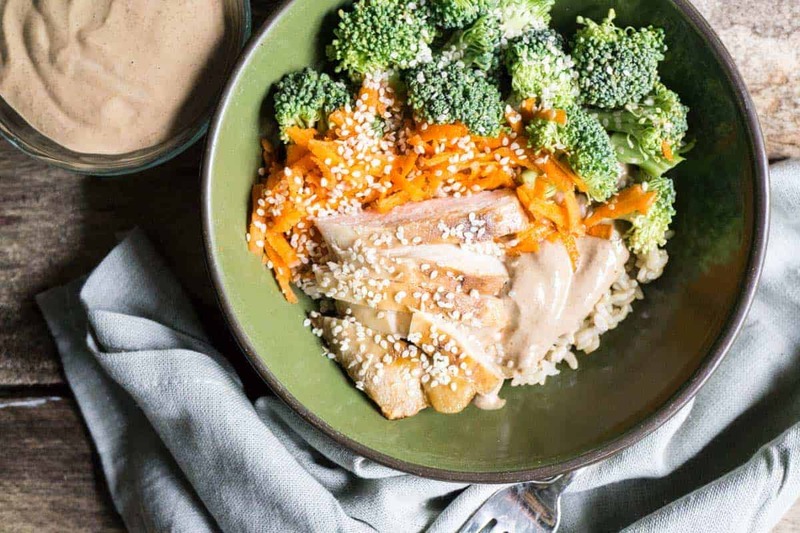 It’s a delightfully sweet and salty combo that tastes delicious soaked into quinoa, or dressing veggies such as snap peas or broccoli. I bemoaned bottled dressings at the beginning of this post, but I must confess: there is one dressing that I keep in the fridge as a backup for whenever I’m out of time/energy. It’s ranch! Conversely, one salad dressing that I would NEVER buy is balsamic vinaigrette! Balsamic vinaigrette is SO simple to whisk up, and it demands to be made fresh. I used to think I didn’t like balsamic vinegar because the only thing I had been exposed to was the bottle dressing, which is severely lacking in flavour! This dressing literally takes seconds to put together and your tastebuds will be thanking you a million times over for it! 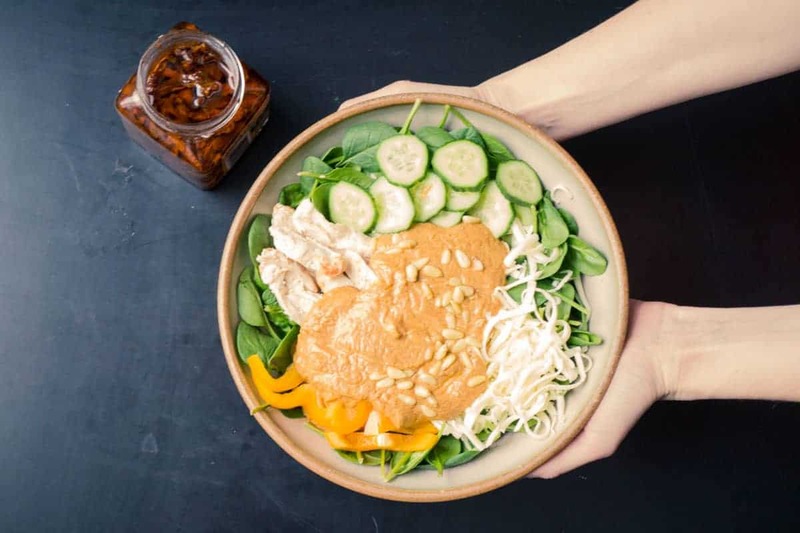 Give your salad a kick of heat with a bit of Thai red curry paste! When you eat a salad, you don’t usually think “spicy” but this dressing has just the right blend of spice, sugar, and salty flavours! Plain yogurt lends creaminess to this dressing without loading on the calories! 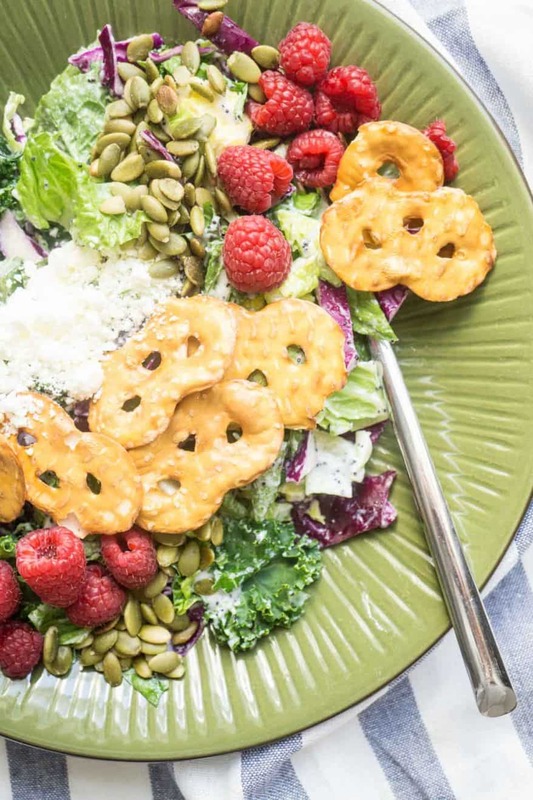 It’s tangy but sweet and goes perfectly on this raspberry pretzel tossed salad. 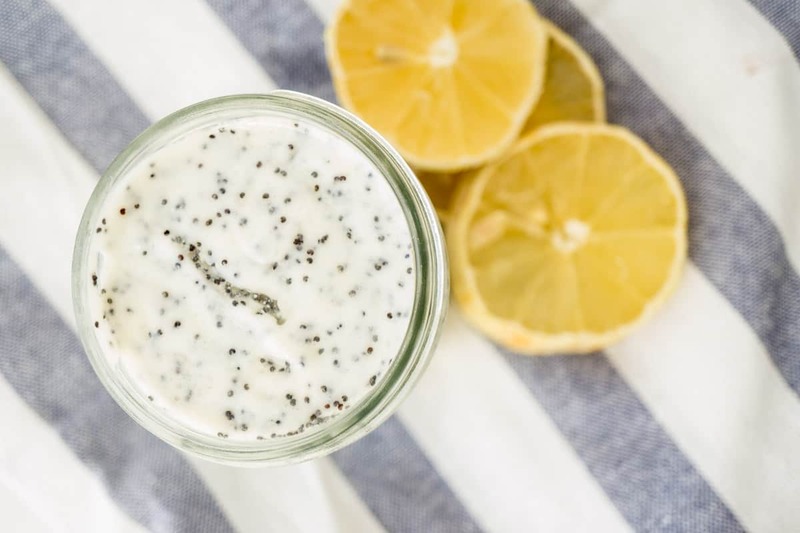 With only a short list of ingredients and whisk you’ll be in lemon poppyseed heaven in no time flat. You are doing such a greater job. Love love love your website, keep going, I am so crazy about it.